1. जिसके पास धन नहीं है वह गरीब नहीं है, वह तो असल में रईस है, यदि उसके पास विद्या है. लेकिन जिसके पास विद्या नहीं है वह तो सब प्रकार से निर्धन है. One destitute of wealth is not destitute, he is indeed rich (if he is learned); but the man devoid of learning is destitute in every way. 2. हम अपना हर कदम फूँक-फूँक कर रखे. हम छाना हुआ जल पिए. हम वही बात बोले जो शास्त्र सम्मत है. हम वही काम करे जिसके बारे हम सावधानी पुर्वक सोच चुके है. We should carefully scrutinise that place upon which we step (having it ascertained to be free from filth and living creatures like insects, etc. ); we should drink water, which has been filtered (through a clean cloth); we should speak only those words, which have the sanction of the satras; and do that act which we have carefully considered. He who desires sense gratification must give up all thoughts of acquiring knowledge; and he who seeks knowledge must not hope for sense gratification. How can he who seeks sense gratification acquire knowledge, and he who possesses knowledge enjoy mundane sense pleasure? 4. वह क्या है जो कवि कल्पना में नहीं आ सकता. वह कौनसी बात है जिसे करने में औरत सक्षम नहीं है. ऐसी कौनसी बकवास है जो दारू पिया हुआ आदमी नहीं करता. ऐसा क्या है जो कौवा नहीं खाता. What is it that escapes the observation of poets? What is that act women are incapable of doing? What will drunken people not prate? What will not a crow eat? 5. नियति एक भिखारी को राजा और राजा को भिखारी बनाती है. वह एक अमीर आदमी को गरीब और गरीब को अमीर. Fate makes a beggar a king and a king a beggar. He makes a rich man poor and a poor man rich. 6. भिखारी यह कंजूस आदमी का दुश्मन है. एक अच्छा सलाहकार एक मूर्ख आदमी का शत्रु है. वह पत्नी जो पर पुरुष में रुचि रखती है, उसके लिए उसका पति ही उसका शत्रु है. The beggar is a miser's enemy; the wise counsellor is the fool's enemy; her husband is an adulterous wife's enemy; and the moon is the enemy of the thief. ...वह धरती पर मनुष्य के रूप में घूमने वाले पशु है. धरती पर उनका भार है. Those who are destitute of learning, penance, knowledge, good disposition, virtue and benevolence are brutes wandering the earth in the form of men. They are burdensome to the earth. 8. जिनके भेजे खाली है, वह कोई उपदेश नहीं समझते. यदि बाँस को मलय पर्वत पर उगाया जाये तो भी उसमें चन्दन के गुण नहीं आते. Those that are empty-minded cannot be benefited by instruction. Bamboo does not acquire the quality of sandalwood by being associated with the Malaya Mountain. 9. जिसे अपनी कोई अकल नहीं उसकी शास्त्र क्या भलाई करेंगे. एक अंधा आदमी आईने का क्या करेगा. 10. एक बुरा आदमी सुधर नहीं सकता. आप पृष्ठ भाग को चाहे जितना साफ़ करे वह श्रेष्ठ भागों की बराबरी नहीं कर सकता. Nothing can reform a bad man, just as the posteriors cannot become a superior part of the body though washed one hundred times. दूसरों का अपमान करने से दौलत जाती है. एक ब्राह्मण का अपमान करने से कुल का नाश हो जाता है. By offending a kinsman, life is lost; by offending others, wealth is lost; by offending the king, everything is lost; and by offending a brahmana (Brahmin) one's whole family is ruined. 12. यह बेहतर है की आप जंगल में एक झाड़ के नीचे रहे, जहाँ बाघ और हाथी रहते है, उस जगह रहकर आप फल खाए और जलपान करे, आप घास पर सोये और पुराने पेड़ों की खालें पहने. लेकिन आप अपने सगे संबंधियों में ना रहे यदि आप निर्धन हो गए है. It is better to live under a tree in a jungle inhabited by tigers and elephants, to maintain oneself in such a place with ripe fruits and spring water, to lie down on grass and to wear the ragged barks of trees than to live amongst one's relations when reduced to poverty. 13. ब्राह्मण एक वृक्ष के समान है. उसकी प्रार्थना ही उसका मूल है. वह जो वेदों का गान करता है वही उसकी शाखाएं है. वह जो पुण्य कर्म करता है वही उसके पत्ते है. इसीलिए उसे अपने मूल को बचाना चाहिए. यदि मूल नष्ट हो जाता है तो शाखाएं भी ना रहेगी और पत्ते भी. 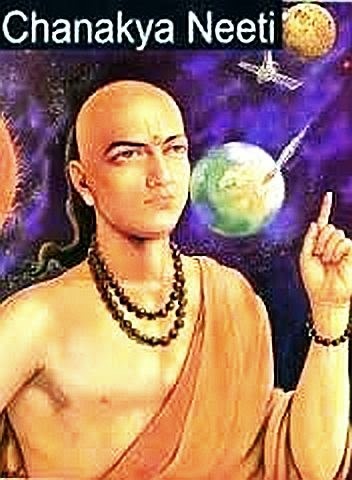 The brahmana (Brahmin) is like a tree; his prayers are the roots, his chanting of the Vedas are the branches, and his religious acts are the leaves. Consequently effort should be made to preserve his roots for if the roots are destroyed there can be no branches or leaves. 14. लक्ष्मी मेरी माता है. विष्णु मेरे पिता है. वैष्णव जन मेरे सगे सम्बन्धी है. तीनों लोक मेरा देश है. My mother is Kamala devi (Lakshmi), my father is Lord Janardana (Vishnu), my kinsmen are the Vishnu-bhaktas (Vaisnavas) and, my homeland is all the three worlds. 15. रात्रि के समय कितने ही प्रकार के पंछी वृक्ष पर विश्राम करते है. भोर होते ही सब पंछी दसों दिशाओं में उड़ जाते है. हम क्यों भला दुःख करे यदि हमारे अपने हमें छोड़कर चले गए. (Through the night) a great many kinds of birds perch on a tree but in the morning they fly in all the ten directions. Why should we lament for that? (Similarly, we should not grieve when we must inevitably part company from our dear ones). 16. जिसके पास में विद्या है वह शक्तिशाली है. निर्बुद्धि पुरुष के पास क्या शक्ति हो सकती है? एक छोटा खरगोश भी चतुराई से मदमस्त हाथी को तालाब में गिरा देता है. He who possesses intelligence is strong; how can the man that is unintelligent be powerful? The elephant of the forest having lost his senses by intoxication was tricked into a lake by a small rabbit. (This verse refers to a famous story from the niti-sastra called pancatantra compiled by the pandit Vishnusharma 2500 years ago). 17. हे विश्वम्भर तू सब का पालन करता है. मैं मेरे गुज़ारे की क्यों चिंता करुँ जब मेरा मन तेरी महिमा गाने में लगा हुआ है. आपके अनुग्रह के बिना एक माता की छाती से दूध नहीं बह सकता और शिशु का पालन नहीं हो सकता. मैं हरदम यही सोचता हुआ, हे यदु वंशियो के प्रभु, हे लक्ष्मी पति, मेरा पूरा समय आपकी ही चरण सेवा में खर्च करता हू. Why should I be concerned for my maintenance while absorbed in praising the glories of Lord Vishwambhara (Vishnu), the supporter of all? Without the grace of Lord Hari, how could milk flow from a mother's breast for a child's nourishment? Repeatedly thinking only in this way, O Lord of the Yadus, O husband of Lakshmi, all my time is spent in serving Your lotus feet.